Directions: The easiest directions is coming from Logansport, Indiana. Take East Us 24 straight into Peru, Indiana. When you arrive in Peru, you will be on Main Street. Stay on Main Street until you come to Broadway which is also known as 19, you will take another right. You will first go over a bridge, over the Wabash River. Immediately after you go over the bridge is the road you want to turn left onto it. The road is IN 124 or locally known as River Road. The road winds and has several vary sharp turns so be careful. When you see signs for the International Circus Hall of fame, you are close. After you pass the hall of fame you will go over a bridge. The road you want is the first road after this bridge that turns right. After you turn on this road it narrows. There are pillars marking the road you need. The intersection is SR 124 & 510E. We went out there twice. Once during the day so we could find where we were going and get a better feel for the land and. The first time was on September 29th. It was a warm sunny day around 80 degrees. First we traveled down the long gravel road only wide enough for one car. There are tons of trees that hang above the road. We stayed on the gravel road and at the end of the road there is a circle you and turn around on. This is where all of the strange occurrences were suppose to happen. There was a tail to the right we walked on for awhile. There were many cold spots in the woods partially because of the shade from the trees. There were two dogs up further on the tail one black and one cream color. There are many farms near by so you can hear all of the animals. We whistled and heard nothing. We searched for the tree described but never found the particular one. The trees were weird there because it was like they had thorns growing from them. Nothing out of the ordinary really happened. The second time we went out there it was October 12th It was a cool night around 70 it was around 9 p.m. We had our camera and tape recorder. We took many pictures but very few came out. It was very creepy especially in the woods. We seen the black dog again and he was going nuts barking and running away from the area. We whistled and something did whistle back, it was a bird wanting to mate with us lol. We walked in the woods and it was freezing. I turned around and there was a shirt on a tree stump that scared the crap out of me. We didn't really see anything, but when we got home and listen to our tape it sounded like someone said "get out of my forest." At the time it was taken we just entered the trail to the left. 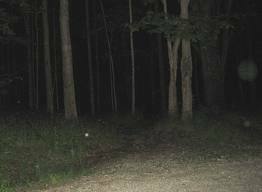 We did get some moving orbs and what I think is an image of a face in the trees. I used to meditate around that region all the time, those trees are whats known as Hawthorne trees. I actually have a war club that has the thorns set in it. I plan to leave a few offerings to my Native American ancestors that inhabit the seven pillars near there.